Serenity in the City just opened our latest addition to our spa! The beautiful wall you see is made up of 900 pounds of Himalayan Salt! But what is Himalayan Salt exactly? This salt can significantly diminish the symptoms of respiratory issues like asthma or allergies, it can also help with your emotional well-being because the salt releases negative ions. Negative Ions are oxygen ions with an extra electron attached. 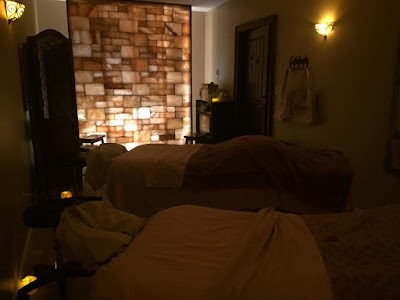 Our Himalayan Salt wall is located in a room that you can book couples massages in. You can also request the Ananda room for just yourself! Serenity in the City will be hosting Yoga soon in the Ananda room on the heated tile. Having a party? Ask if the Ananda room is available for your guests. Enjoy your services, yoga class, or party in this beautiful atmosphere. **The Ananda room has its own private bathroom.